A great team of locksmiths here in Columbus will do so much more for you than open a few locked doors; they’ll provide you with the peace of mind that is worth so much more. Not everyone in our line of work can even compare to what we do at Buckeye Locksmith. For instance, our locksmith services are available to you 24/7; that means that when other teams are closed for the evening, we’re alert and ready for your call — whether that comes at 3 a.m. or 3 p.m. Since you can’t always control or predict when you’re going to need your Columbus Locksmith, Buckeye offers our services at any time of the day or night. In addition to our availability, we also offer a number of services that many of our competitors simply don’t have the capacity or business savvy to offer you. In addition to our amazing, 24/7 business hours, which we proudly maintain so that we’ll always be able to get to our Columbus customers, we also have one of the broadest service areas of any Columbus locksmith. In an effort to get to as many people who need locksmith services as we can, we’ve expanded our coverage area to include, not only Columbus proper, but all of the surrounding suburbs. Our locksmith team can venture as far west as West Jefferson, as far North as Galena, as far east as Pataskala, and as far south as Ashville. No matter where you are in the Columbus area, your Columbus locksmith will do everything that we can to get help to you as soon as possible. Can we handle the basic lockout, lock change, or key replacement? Of course. But what about our other services? Instead of simply limiting things to the basics and offering only the most rudimentary locksmith services to Columbus residents, Buckeye Locksmith has the ability to get technical with our residential, commercial, and automotive locksmith services. Let’s take a look at how we specialize in each of these three services. Residential locksmith services are often taken more seriously by folks here in Columbus. Ohio residents trust professionals with their home keys, their lock changes, and even often grant them access to their home because of locksmith work that needs to be done therein. Being trusted with access to someone’s home is an extremely important thing, and we take that privilege extremely seriously at Buckeye. Your home’s security is of the utmost importance to us and we’ll do everything we can to prove that we’re trustworthy, loyal, and that integrity is the driving force behind everything that we do. When it comes to our residential locksmith services here in Columbus, we offer quite the variety. It’s happened to the best of us. You think that you have your keys in your pocket, you walk out the door, making sure to lock it, and realize your mistake. It only takes a moment to lock yourself out of your home, but the frustration often lasts much longer. Luckily, when you find yourself locked out, the “key” to getting back in is only a phone call away. Your Columbus locksmith can get to your residence quickly, get you back in moments, and leave you with the satisfaction and peace of mind that we’ve become known for. One of the most common reasons for us to offer our residential locksmith services to the people of Columbus is due to people’s need for a lock change or “rekey.” People need rekeying services for their homes for all kinds of reasons but some are more common than others. We’re often called to people’s homes to perform a lock change shortly after they’ve moved into their new house. As a security measure, people ask that we change the locks to ensure that no one else has access to their home. We’re also called upon to change the locks after there’s been a break-in or compromised lock. Though we’re never happy to hear about these circumstances, we’re passionate about providing Columbus families with an extra level of security. Many homeowners are moving toward the use of electronic locks and keyless access to their Columbus homes. These high-tech security measures offer a higher level of security, restricted access to the home, and added convenience for everyone who enters on a regular basis. Imagine never needing to worry about losing your keys or locking them in your home or car. When you have keypad access or keyless entry capabilities to your home, you’ll never have to worry about how to get in. To learn more about upgrading your old locks to our residential electronic locks, reach out to the best locksmith Columbus has to offer: Buckeye! We understand that since creating duplicate keys to your home can be something that makes homeowners uneasy — and understandably so — we take the process extremely seriously. We’re not only cautious about who handles your key, we’re precise and detailed from start to finish so that you’ll walk away from the experience with ease, comfort, and with confidence in us and what we do. Do you love the idea of having access or locking capabilities with the use of your phone or device? You’ll never leave for vacation with the fear or worry in the back of your mind that you forgot to lock the house. With our wireless locks that you can access with your device, you’ll be able to not only double check that everything is secure, you’ll be able to lock anything that was left accessible. Contact your Columbus locksmith to learn more about adding wireless locks to your home. Whatever residential locksmith services you’re in need of, don’t trust just any locksmith with the access to your keys and your home, Buckeye is the best team of locksmiths in Columbus and we’re ready to step up to the plate. Take a look at some of our testimonials and reviews to learn more about our customer service, our work ethic, and our commitment to excellence. Now that we’ve had a chance to look at Buckeye’s residential services, let’s dive into all of the commercial services that we offer the people in and around Columbus. When it comes to the safety and welfare of their company, Columbus business owners require locksmith services that are a step above what the average locksmith provides. Business owners want satisfaction guarantees, a record of professionalism, and a trail of happy customers to back up their claims of providing excellence in everything. Business owners in Columbus simply want a higher level of professionalism and proficiency and for that reason, we offer our professional commercial locksmith services to Columbus businesses of all varieties. Let’s take a look at some of our most popular commercial locksmith services. Just like residential lockouts, business lockouts can also be frustrating, life-interrupting, and time-consuming. However, when Columbus business owners are dealing with a business lockout, there can be so much more at stake. Locking your keys inside your Columbus business can potentially cost your company time, money, and your good reputation. Though it can (and does) happen to anyone, being locked out of your business can present a sloppy persona that doesn’t fairly represent you and your principles. For that reason, we believe that experiencing a commercial lockout is something that you want to find a solution for as soon as possible. When you find yourself locked out of your Columbus business, don’t trust any other locksmith team but us. Many businesses operate with a master key system, meaning that there are a few trusted employees who have a master key that opens all or most doors, leaving lower level employees with limited access. Since you don’t want to give every employee access to your office, security room, vault, or other room containing delicate or valuable items, a master key system can offer a great solution. Contact your Columbus locksmith for more information. Just like with residential locks, commercial locks must be trustworthy and secure at all times. Your lock can be the difference between a break in and a decision that “it’s not worth the trouble.” When a business has locks that are old, outdated, or compromised, breaking in is easy and too tempting for many criminals to pass up. Consider upgrading to either a lock with a higher level of security, wireless locks, or an electronic lock with a keypad. When potential burglars see how difficult and time-consuming breaking into your business will be, they’ll mostly likely think twice before trying. 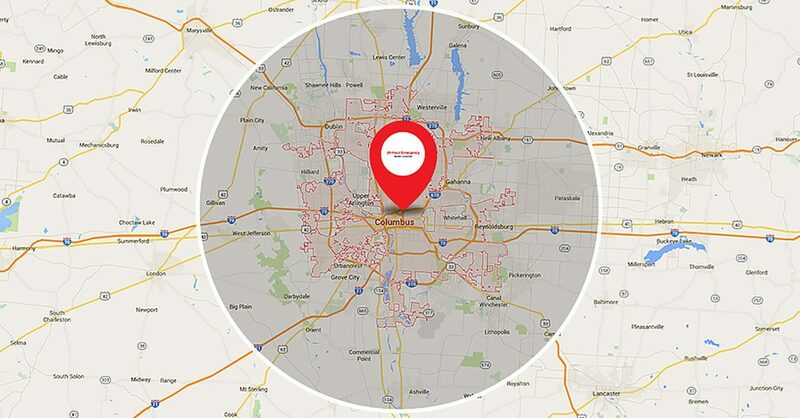 Don’t leave your Columbus business vulnerable, reach out to Buckeye today. With the added security measures that access control systems offer to business owners, many Columbus companies are choosing to implement them. With this system, employees are given key cards or key fobs and are allowed access to certain areas of the building. There are multiple advantages to access control systems because they allow business owners to see who is in their business and at what times. They can also easily limit clearance to certain areas in which they don’t want every employee to have direct access. To learn more about getting access control systems in your business, reach out to your Columbus locksmith today! Though we’ve only mentioned a few of our amazing commercial locksmith services, we’re able to handle so much more in this area. No matter what your commercial locksmith needs are, Buckeye has the experience, the professionalism, and the work ethic to make sure that you’re 100 percent satisfied with our services. Whether you’ve been locked out of your business, you want to go to a master key system, or you’re ready to switch over to access control systems, reach out to Buckeye today! Let’s continue learning about all of the services that we offer here at Buckeye with our final category: automotive locksmith services. Here are all the reasons to call us when you’re in need of a car locksmith here in Columbus. Since we are a 24/7 mobile locksmith in Columbus, we’re often called upon to help those who have been locked out of their cars, break their key in their ignition, need emergency trunk opening, or need help with transponder keys. Since our automotive locksmith services are so varied and extensive, let’s take a moment to look at each one in a little bit more depth. Since we can’t predict when we’re going to become locked out of our cars, it’s good to know that there’s a 24/7 auto locksmith on standby so that you won’t have to worry or wait. Auto lockouts can be especially serious because depending on where you lockout takes place, you can easily find that your safety or security is compromised. When you’re locked out of your vehicle, first make sure that you’re in a safe location, secondly, contact your local auto locksmith in Columbus. We’ll get you back in your car in no time. In this day and age, keeping your vehicle safe from theft is a real concern for many Columbus area residents. For that reason, Buckeye Locksmith offers services to either duplicate or originate a high-security key for any make or model vehicle. No matter whether or not you have a high-security key for your car, your Columbus locksmith can offer you an excellent high-tech key at a fraction of the price your dealer would charge you. To learn more, contact us today. As professional automotive locksmiths in Columbus, we expect plenty of calls that are made by people who are dealing with a certain level of stress. One of these situations includes when someone breaks their key off in their ignition. There is, perhaps, nothing quite as frustrating as a car owner than having this unfortunate circumstance befall you. However, when it does, your Columbus locksmith is here to help. Not only can we retrieve the key that you might have thought was lost for good, we can make any necessary repairs to your ignition, and even replace it if needed. There are a number or reasons why a vehicle owner might want to rekey their car, and luckily, the expert locksmiths at Buckeye are up for the challenge. Whether you’re dealing with broken locks or you’d like to preserve the security of your vehicle, changing the locks on your vehicle is as simple as calling your automotive Columbus Locksmith. When it comes to the safety of your family and loved ones, there is nothing we value more. We are proud to offer free child rescue for all of our Columbus area customers. We understand how traumatic and upsetting it can be to accidentally lock your child in a car. It can even become dangerous depending on the temperatures. Not to worry, Buckeye Locksmith will come to you and your child’s rescue and what’s more, we won’t charge you for this service. This is just one more way that Buckeye puts the people of Columbus first. Whether you need to be let back into your car, you want a high-security key, you need ignition repair, or anything else, do yourself a favor and reach out to us first. We’d love to be the ones to come to your rescue. At the end of the day, your Columbus locksmith is passionate about being there for the people of Ohio. We want people to be able to call us knowing that we’re trustworthy, professional, and ready to do whatever we can to help out and bring a solution to frustrating circumstances. Whether you need residential locksmith services, you have a commercial locksmith job for us, or you’re looking for an amazing auto locksmith, you can do no better than Buckeye Locksmith. Let us come to your rescue! In the meantime, take a look at our customer reviews and check out our website to learn more about our services, to check out our service areas, and to reach out to us!